The fact that ICE has knowingly released criminal illegal aliens into the U.S. population is just the latest in a long series of episodes that show how the federal government’s lawless approach to border security and immigration law enforcement jeopardizes the American people. 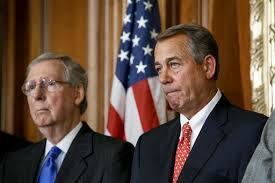 Will they save America from a tyrannical unconstitutionally out of control President. 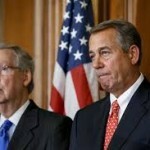 The last-minute move comes after House Republicans dealt a humiliating defeat to John Boehner. The House voted late Friday to stave off a shutdown of the Department of Homeland Security for another week, narrowly averting a funding lapse for the agency that has become the battleground over President Barack Obama’s executive actions on immigration. The vote was 357-60. The Senate approved the stopgap measure earlier Friday evening and it was signed by Obama minutes before the midnight deadline when the department’s funding was to expire. The 11th-hour move came after dozens of House Republicans dealt a humiliating defeat to Speaker John Boehner (R-Ohio) and other GOP leaders. Conservatives teamed up with Democrats to shoot down a Boehner-backed measure that would have funded DHS for three weeks. DHS funding extended for one week. night, the House passed a one-week extension of funding for the Department of Homeland Security and the Senate followed suit. The votes capped off a volatile day in which, for the most part, Republicans fought to defund President Obama’s executive amnesties after Senate Majority Leader Mitch McConnell, R-Ky., caved to Democrats who had been blocking the agency’s funding. What gun control looks like: getting raided by the feds! For over half a century America has struggled to improve race relations and progress is modest, at best. But optimism soldiers on although failure only seems to breed desperation. A recent New York Times article recounts the latest crackpot panacea. The article tells how wealthy white children enrolled in some of New York City’s toniest and expensive private schools are being detoxified of their poisonous white racism. The message is that these youngsters must develop “anti-racist thinking” as a skill, a competency necessary for the 21st century. It exaggerates only slightly to compare this process with Maoist self-criticism where people publicly confessed to crimes, many imaginary, and then admit remorse as the first step in “voluntarily” embracing the party line (see here). Robert Putnam’s sobering new diversity research scares its author. Birthright Citizenship is the practice of granting automatic citizenship to children born in the United States. Under current federal law, nearly all children born in the U.S. receive automatic citizenship, regardless of whether their parents are lawfully in the country. This practice has created a magnet for foreign nationals who want their children to have U.S. citizenship and spawned creation of a cottage industry devoted to helping pregnant “tourists” illicitly enter this country for the purpose of giving birth.